On Sunday, October 30, the London Daily Mail published the following two graphs. The first graph labeled “Graph That Fooled The World” came from the BEST study that was released prior to peer review and publication. The lead author Professor Richard Muller and his team from Berkley (University of California) Earth Surface Team (BEST) claimed that the chart showed that–the planet has warmed by almost a degree centigrade since 1950 and is warming continuously. He said according to the Mail that the research: “proved you should not be a sceptic, at least not any longer.” This graph was presented to the MSM over a week ago. It was reprinted for today’s edition along with the second graph which is new. 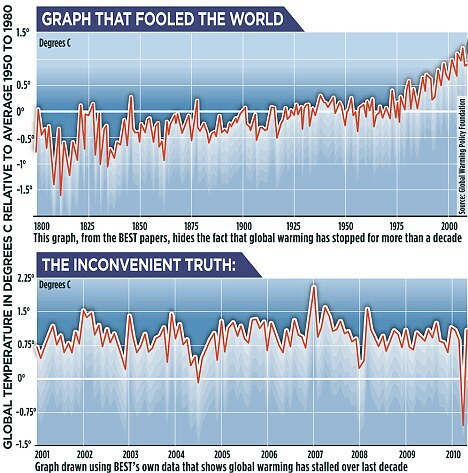 The second graph titled The Inconvenient Truth uses the BEST data that show global temperatures at a standstill. This Graph was not sent to the media by Muller. And you should probably not hold your breath waiting for a mea culpa from the MSM for their jumping on a story that was at a minimum misleading if not intentionally wrong. There is another posting that Greenwire titled “Provoked scientists try to explain lag in global warming.” The expert warmer scientists, in their own words, can not answer this question. Interestingly, they have many theories but no CONSENSUS. Obivouly nothing any of them say can possibly be correct if there is no CONSENSUS. I will comment on that posting next. For a full reading of the Mail story, click here. This entry was posted in AGW, cap and trade, Climate Models, ClimateGate, CO2, Environment, Global Temperatures, Government Regulations, IPCC, United Nations. Bookmark the permalink.